Everybody's always trying to come up with ways to get greens into their diets, and we're no exception. Some people like just eating chard or other greens just straight up, but I generally can't convince myself to do that unless it's watercress or something really crisp and full of water. There's always gumbo, and that's awesome, but it's so time- and energy-intensive, even expensive, that I'm not going to make it all that often. So I've been wanting to try to make the following for quite some time, basically ever since I first tried it at Agua Verde Cafe & Paddle Club in Seattle. 1. Place onions, garlic, chard, and 1 cup stock in a food processor. Process to a fine paste. Season with salt and pepper. 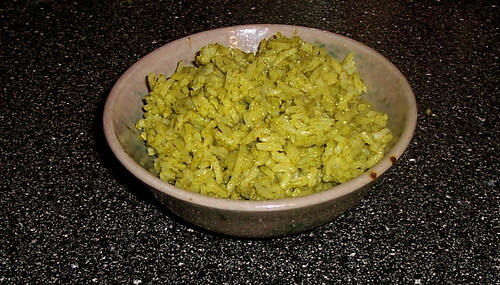 3 comments on "Green Rice with Chard"
I ended up on your blog because I wanted to see how the blog software looked, but by coincidence I have a bunch of leftover Chard, so I'm going to make rice tomorrow! Thanks for the recipe. Btw, do you have problems with spammers? I also use the number thing, but still get spam on my website. Hi Maria! I did get spam until I started also using PmWiki's Blocklist. it works pretty well.